This document should be read alongside. Every year, hundreds of children in Norfolk are referred to our children’s social care services by individuals who had concerns about their welfare. For children who need additional help, every day matters. The actions taken by professionals to meet the needs of these children as early as possible can be critical to their future. Children are best protected when professionals are clear about what is required of them individually, and how they need to work together. Professionals help best when all local agencies have carried out a thorough assessment and drawn up a plan for support. Ultimately, effective safeguarding of children can only be achieved by putting children at the centre of the system, and by every individual and agency playing their full part, working together to meet the needs of our most vulnerable children. This protocol aims to secure the cooperative working that is essential for the effective assessment of needs and the identification of the services to be provided. It sets out how we, Norfolk County Council and partner agencies along with parents/carers, children and young people, will assess, plan and manage cases when there are concerns about a child and where the threshold for a children’s social care assessment (under the Children Act 1989) is met. It also aims to explain the journey that children will take through the assessment process, providing support to them and their families on the way. What is a Local Protocol? The Local Protocol is a ‘handbook’ that describes what the Local Authority (LA) will do when a child is referred to the LA for support (in Norfolk this is NCC). It is a map that guides the child’s journey through assessment and planning. The main purpose of the Local Protocol for Assessment is to set out the arrangements for how cases will be managed once a referral has been received by Norfolk County Council’s Children’s Services. The Local Protocol will also explain what help a child receives before the thresholds are met for statutory assessment, such as when children and families require Early Help. In this document a child is defined as anyone who has not reached their 18th birthday, including unborn children. ‘Children’ therefore means ‘children and young people’ throughout. The fact that a child has reached 16 years of age, is living independently or is in further education, is a member of the armed forces, is in hospital or in custody in the secure estate, does not change his/her status or entitlements to services or protection (Definition provided by Working Together 2018). An assessment is a process of collecting information that allows somebody to understand what is happening to a child so the child can be helped. It is the story of the child’s life, who they are, who they know and what is happening to them. Whilst it is the parents’ responsibility to bring up their children, they may need assistance from time to time to do so. The assessment will normally be completed in partnership with parents and will involve a range of professionals who will contribute in order to keep the child safe and help them if they have needs, such as a disability. Why have a local protocol for Assessment? In March 2018, the Department of Education published “Working Together to Safeguard Children 2018. A guide to inter-agency working to safeguard and promote the welfare of children”. Working Together explains what the LA and other organisations should do to safeguard and promote the welfare of children. The government has asked all LA’s with their partners to write and publish a ‘Local Protocol for Assessment’. The Local Protocol allows children, young people, their families and everyone who works with them to understand exactly what process they can expect whilst children are being helped by Norfolk County Council. Who is the Local Protocol for Assessment for? A threshold is a point at which something might happen, stop happening or change, in relation to providing services to a child, young person and their family to make sure the child or young person has the right people doing the right things to keep them safe, healthy and achieving the best in life we and they could hope for. In Norfolk we wish to put more value into getting the right Assessments, Services and Support in place for children and their families in times of need rather than employing a check list of thresholds that is mechanistic and does not take into account the strengths and resources that families have or the complexity of their situations. What is important to us is that the right conversations are happening at the right times to identify children in need. Where there is a concern for a child or young person, you should contact CADS on 0344 800 8021. The call will be answered by a Consultant Social Worker; state clearly that you have a concern for a child’s wellbeing and wish to report that concern. CADS will ask for child’s name and address, this enables them to check if the child already has a social worker. CADS will ask for all of the details known to your agency about the child, their family composition including siblings, the nature of the concern and your view of immediate risks. They will also need to know where the child is now and whether you have informed parents/carers of your concern. Every phone call will be followed up in writing by the Consultant Social Worker. It is also best practice to keep a record of the contact you have made, the discussion and any decisions made. You should also record whether you have obtained parental consent and if not, why not. Where the concerns for a child are immediate and serious, the CADS information gathering process runs parallel to essential safeguarding action planning between Children’s Services, the police and health. CADS is an advice and duty signposting service which may include information gathering analysis and decision making. CADS does not provide direct services to children. Assessment and family intervention teams work directly with children and families. Every phone call will be followed up in writing by the Consultant Social Worker. It is also best practice to keep a record of the contact you have made, the discussion and any decisions made. You should also record whether you have obtained parental consent and if not, why not. Be undertaken using a whole family approach which takes account of the perspectives of family and extended family, professional and naturally occurring networks. The purpose of assessments is to enable effective, evidence based decision making. Decisions must be recorded and shared with children, families and partner agencies involved with them. Recording will always include information on the child’s development so that progress can be monitored to ensure their outcomes are improving. This will reduce the need for repeat assessments during care proceedings, which can be a major source of delay. Early Help is about engaging with children, young people, their families and communities at the first point of need and maximising opportunities for them to achieve their potential without the need for long term support or intervention. All staff and professionals therefore need to “think family – think early help” and respond appropriately. In most cases this will involve helping a family resolve the issues themselves by providing them with information about universal services they can access. For families where there is increased vulnerability it will mean sharing information so that early support can be provided by the appropriate services. Some families will require more targeted support such as parenting programmes or family support. In a small number of cases it will involve calling upon specialist services to help meet an identified need. Our early help offer recognises the role that all family members (mothers and fathers, step parents, grandparents, siblings and other extended family members and carers) can play in influencing what children experience and achieve. Central to our early help offer is the early identification of children and families who would benefit from early help and a co-ordinated early assessment and response to improve outcomes for children and families as a whole. The Norfolk Family Support Process provides a framework from which to build a holistic picture of a family’s circumstances, including areas of strength and resilience and areas requiring support. The Family Support Form assessment is designed to be completed alongside family members and shared with other relevant workers who may form a team around the family in order to develop a family plan and provide appropriate support. The assessment should be undertaken with the agreement of the child and family, it requires honesty about the reason for completing the assessment as well as clarity about the presenting concerns. The Family Support Form assessment evidences the perspectives of family members and always takes account of the feelings and wishes of children and young people. All Family Support Process (FSP’s) assessments need to be registered with the local Early Help Teams. What is a Statutory Assessment under the Children Act 1989? A statutory assessment is an assessment required by law under the Children Act 1989. Local Authorities are required to provide services for children in need for the purposes of safeguarding and promoting their welfare. Local Authorities undertake assessments of the needs of individual children to determine what services to provide and action to take. A children’s social care assessment is a multi- agency assessment carried out under Section 17 of the Children Act 1989. This requires working together with children, young people and families and it will require their consent to progress. A Norfolk County Council social worker is responsible for leading the assessment and has a duty to ascertain the child’s wishes and feelings and take account of them when planning the provision of service. 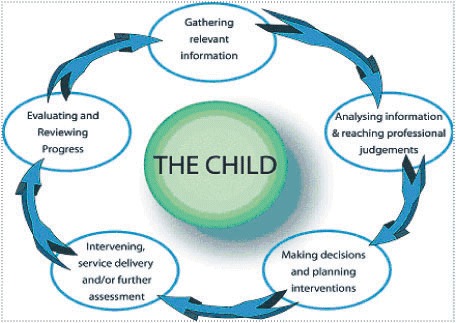 If information gathered during an assessment (which may be brief) results in the social worker suspecting that the child is suffering or is likely to suffer significant harm, then Norfolk County Council, under Section 47 of the Children Act 1989 is required to make enquiries to decide what action must be taken, with partners, to safeguard and promote the welfare of the child. There may be a need for immediate protection whilst the assessment is carried out. Following an application under Section 31A of the Children Act 1989, where a child is subject of a Care Order, Norfolk County Council must assess the child’s needs and draw up a care plan which sets out the services which will be provided to meet the child’s identified needs. Where a child is accommodated under Section 20 of the Children Act 1989, Norfolk County Council has a statutory responsibility to assess the child’s needs and draw up a care plan which sets out the services to be provided to meet the child’s needs. Where a child becomes looked after, the assessment will be the baseline for work with the family while the child is away. Any needs which have been identified must be addressed before decisions are made about the child’s return home. An assessment by a social worker is required before the child returns home under the Care Planning, Placement and Case Review England Regulations 2015. This will provide evidence of whether the necessary changes and improvements have been made to ensure the child’s safety when they return home. A children’s social care (statutory) assessment in Norfolk is called a ‘Social Work Assessment’. The Social Work Assessment has replaced what was previously known as an Initial Assessment and Core Assessment. The timeliness of the Social Work Assessment is a critical element of the quality of that assessment and the outcomes for the child. The timescale in which an assessment is completed will be determined by the needs of the individual child or children, the nature and level of risk of harm experienced by the child and the degree that parents and family are engaging with the process. A judgement will be made by the social worker, in discussion with their manager on each individual case and an assessment should not exceed 35 days, (which is well within the 45 day maximum limit suggested in Working Together 2018). There will be a number of check points to ensure the assessment is undertaken in a timely way and any immediate intervention that may be required is in place as soon as possible. These will take place on day 1, day 7-10, day 11-20, and day 21-35. Managers are required to check progress at each of these points. They must also provide the rational for any assessment taking more than 35 days to complete and when/how the assessment will be completed. The Social Work Assessment should always be undertaken alongside a Social Work Chronology to ensure that historical information known about the child/children and their family is taken into consideration in the assessment. Past harm is the most important factor in assessing future risk. The Consultant Social Worker will make a decision as to whether a contact requires a statutory response and becomes a referral to Children’s Services (Section 17 or Section 47). In urgent and very serious cases (mostly Section 47) the decision will be made immediately and will be prioritised without delay with a visit by a social worker within the same 24 hours of referral decision to assess the child’s/children’s welfare. For less urgent cases (Section 17) the child must be seen by a social worker within 10 working days of the referral decision. For children who require immediate protection, action must be taken by the social worker, or the police or NSPCC if removal is required, as soon after the referral decision has been made (Section 44 and 46 of the Children Act 1989). The team manager in discussion with the social worker will set the timescale at the outset of the assessment process for its completion. The maximum timeframe for the assessment to conclude, such that it is possible to reach a decision on next steps, should be no longer than 35 working days from the point of referral decision. It is the responsibility of the social worker to make clear to the child and their family how the assessment will be carried out and shared with the child, their family and relevant partners within the agreed completion date. The social worker will evaluate the type and seriousness of risks of harm to the child; in doing so all current ‘risk assessments’ provided by partner agencies will be considered. The evidence base of any risk assessments should be made available to the assessing social worker by the relevant agency so this can be discussed with the family, as is appropriate in each case. Whatever the timescale for assessment and where particular needs are identified at any stage of the assessment, the social worker will not wait until the assessment is completed before commissioning services to support the child and their family. In some cases the needs of the child will mean that a quick assessment will be required. Providing services or initiating Care Proceedings should not be delayed until the assessment is completed, as this can have a detrimental impact on the child’s development. It is important for the child that they are able to reach their full developmental needs at the right time throughout their life. For cases where child protection concerns arise, the assessment will be completed in accordance with Section 47 of the Children Act 1989. The assessment must be completed within 13 days of the first strategy discussion to enable the assessment report to be available to an Initial Child Protection Conference (ICPC). The ICPC must be held within 15 working days of the strategy discussion at which the decision to initiate a Child Protection Enquiry was made. The social worker will go through the Social Work Assessment and chronology with the child/ children and family 2 days prior to the Initial Child Protection Conference. For cases where there are no child protection concerns but where the child is believed to be a Child in Need, the assessment will be completed under Section 17 of the Children Act 1989. At the start of the assessment, the social worker will see the children individually, discuss with the team manager and agree with the family the length of time it will take for the assessment to be completed within 35 working days. Assessments carried out for looked after children will also be completed within 35 working days and focus on the child’s developmental progress, including his/her health, and the desired outcomes for the child, taking account of the wide range of influences which affect a child’s development both positively and negatively, using the Assessment Framework. These assessments take place in consultation with family members and carers and well as the child themselves, and will be shared accordingly. The team manager and social worker will discuss the progress of the assessment prior to the anticipated completion date. If there are valid reasons for the assessment not being completed within the agreed timeframe, this will be recorded and a revised timeframe will be set if appropriate. The reason for delay must be valid and approved by the team manager. Where child protection concerns become evident in the course of a S17 assessment then the team manager will convene a multi-agency strategy discussion in accordance with the NSCB Child Protection Procedures. This is the only occasion, prior to assessment completion, when it is routine to share progress of an assessment with other professionals, however, good communication between all professionals involved in the assessment is the expectation throughout. In Norfolk, all assessments will use the Framework for the Assessment of Children in Need and their Families (as set out in Working Together 2018), underpinned by the Signs of Safety approach. Social Work Assessments are family friendly. This means that all related children living in the same household can and should be included in the assessment to prevent families from negotiating excessive paperwork. However, the individual needs of each child must be explored separately, including their relationships with each other and their parents. Any concerns about ‘scapegoating’ of any child or children within the family should be explicit in the assessment. Where the needs of children greatly differ, consideration can be given to undertaking separate assessments for each child, particularly where this would benefit the child. In this document, the ‘child’ refers to all children who are subject of the assessment. All information should also be analysed within the Signs of Safety framework to ensure that past harm, future danger, complicating factors, strengths and safety within the family and future safety needs are recognised and responded to. The Assessment provides clear evidence for decisions and what needs to happen to provide good outcomes for the child and family, including any services required. The parent’s consent should usually be sought, before discussing a referral about them with other agencies, unless this may place the child at risk of Significant Harm, in which case the social work manager should initiate a Strategy discussion (see Strategy Discussions Procedure). If there is suspicion that a crime may have been committed including sexual or physical assault or neglect of any child, the Police must be notified immediately. When consent is obtained, all agencies and professionals involved with the child, and the family, have a responsibility to contribute to the Assessment process. This might take the form of providing information in a timely manner and direct or joint work. Differences of opinion between professionals should be resolved speedily but where this is not possible, the local arrangements for resolving professional disagreements should be implemented. It is possible that professionals have different experiences of the child and family and understanding these differences will actively contribute to the understanding of the child and their family. For cases where there are concerns about neglect, assessments should include use of the Graded Care Profile in order to monitor the impact on the child’s development and check progress is being made. Please see also: Norfolk Safeguarding Children Board website, Information on Neglect. Attention will be paid to ‘drift and delay’ and all parties contributing to the assessment will be responsible for timely completion. If drift or delay is having an impact on the outcomes for the child, there is accountability for all agencies to the NSCB. Where there is a delay, or any other issue of concern, the NSCB Resolving Professional Disagreements process (see Resolving Professional Disagreements Procedure) or individual agency complaint processes are available for professionals, parents and children. All agencies contributing to the statutory assessment process will have a responsibility to ensure that their staff work within the Protocol and that their staff have received the necessary safeguarding training. Agencies providing services to adults who are parents, carers or who have regular contact with children must consider the impact on the child of the particular needs of the adult in question. The child should participate and contribute directly to the Assessment process based upon their age, understanding and identity. They should be seen alone and if this is not possible or in their best interest, the reason should be recorded. The social worker should work directly with the child in order to understand their views and wishes, including the way in which they behave both with their care givers and in other settings. Every Assessment should be child centred. Where there is a conflict between the needs of the child and their parents/carers, decisions should be made in the child’s best interests. The parents should be involved at the earliest opportunity unless to do so would prejudice the safety of the child. The parents’ involvement in the Assessment will be central to its success. At the outset they need to understand how they can contribute to the process and what is expected of them to change in order to improve the outcomes for the child. The Assessment process must be open and transparent with the parents. However, the process should also challenge parents’ statements and behaviour where it is evidenced that there are inconsistencies, questions or obstacles to progress. All parents or care givers should be involved equally in the Assessment and should be supported to participate whilst the welfare of the child must not be overshadowed by parental needs. There may be exceptions to the involvement in cases of Sexual Abuse or Domestic Violence and Abuse for example, where the plan for the Assessment must consider the safety of an adult as well as that of the child. The wider family should be engaged in the assessment where there is agreement to do so from the parents. Encouraging the involvement of wider family can often provide additional support and/or safety for the child and assessments should be made to determine this. It can also help parents understand what professionals are worried about. A ‘rapid network meeting’ should be initiated in the early stages of an assessment (by working day 20) to support this process in the best interests of the child. Family members will always need to be assessed where a child goes to live with them during the course of an assessment. See also Child protection: Working with foreign authorities Guidance (DfE, July 2014). The reasons for the Social Work Assessment and the outcomes of the assessment should be explained in language that the family can understand, using family or children’s terms where understanding will be enhanced by doing so. Explanations should be free from professional jargon, acronyms and abstractions. The use of the Signs of Safety approach and tools will promote this. Where a child or parent speaks a language other than that spoken by the social worker, an interpreter should be provided. Where a child or parent with disabilities has communication difficulties it may be necessary to use alternatives to speech. In communicating with a child with such an impairment, it may be particularly useful to involve a person who knows the child well and is familiar with the child’s communication methods. However, caution should be given in using family members to facilitate communication. Where the child has had a communication assessment, its conclusions and recommendations should be observed. Assessments must be shared in writing with families using straight forward, jargon free language. What needs to happen to ensure future safety and wellbeing for the child, and allow specialist services to withdraw. The social work manager should provide regular supervision and challenge the social worker’s assumptions as part of this process. An informed decision should be taken on the nature of any action required and which services should be provided. 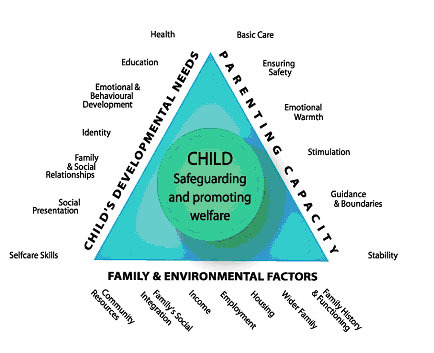 Social workers, their managers and other professionals should be mindful of the requirement to understand the level of need and risk in a family from the child’s perspective and ensure action or commission services which will have maximum positive impact on the child’s life. Supervision records and/or checkpoints in the assessment should reflect the reasoning for decisions and actions taken. Assessment should be a dynamic process, which analyses and responds to the changing nature and level of need and/or risk faced by the child. A good assessment will monitor and record the impact of any services delivered to the child and family and review the help being delivered, in partnership with the child and their family. Whilst services may be delivered to a parent or carer, the Assessment should be focused on the needs of the child and on the impact any services are having on the child. Recording by all professionals should include information on the child’s development so that progress can be monitored to ensure their outcomes are improving. This is particularly significant in circumstances where Neglect is an issue. There is an expectation that the Graded Care Profile will be used to support this process. Assessments, chronologies, genograms and resulting Plans following from meetings should be circulated to the participants including the child, if appropriate, and the parents. The child has a safety plan and/ or support plan specific to them. The Director of Children’s Services must approve the ending of LAC status for any young people age 16 and 17 years who had a previous Care Plan to remain Looked After long term until 18 years. A disabled child in a family will receive a Statutory Assessment as any other child. Any service eligibility assessment, carer assessment or special educational need assessment will be taken into consideration by the assessing social worker before concluding the analysis and agreeing with the family any future multi-agency plan. Any Education, Health & Care Plan assessment will take into account any statutory assessment that has occurred within 3 months. Where a child is known and open to a social worker or child and family worker, then the Education, Health & Care Plan Co-ordinator leading the assessment will initiate contact and receive an update of the child’s progress and family circumstances as identified in the last review of any plan so that assessments of educational, social and health needs are coordinated. If a young person aged 13+ has a disability which means they may receive a service when they become an adult, the assessing and reviewing social worker will use the Transition Protocol to guide further assessment of needs for services into adulthood. Young carers are children under the age of 18 who provide regular and ongoing significant unpaid care or emotional support to a family member or friend who is physically or mentally ill, disabled, or misuses alcohol or other substances. The child or young adult has caring responsibilities that are important and relied upon within the family in maintaining the health safety or the day to day wellbeing of the person receiving care or of the wider family. It does not apply to the everyday and occasional help around the home that may be often expected of or given by children and families and is part of community and family cohesion. Young adult carers are aged 16 to 25 years and have specific needs and rights as they make the transition to adulthood. The Children and Families Act 2014 amended the Children Act to make it easier for young carers to get an assessment of their needs and to introduce ‘whole family’ approaches to assessment and support. Local authorities must offer a young carers needs assessment if a child or their parent requests it or where it appears that a child is involved in providing, or intending to provide, care. This legislation is aligned with similar provision in the Care Act 2014 requiring local authorities to consider the needs of young carers if, during the assessment of an adult with care needs, or of an adult carer, it appears that a child is providing, or intends to provide, care. In these circumstances the authority must consider whether the care being provided by the child is excessive or inappropriate; and how the child’s caring responsibilities affects their wellbeing, education and development. These duties were implemented on 1st April 2015 and are reflected in Working Together to Safeguard Children 2018. No care package for a child or adult should rely on excessive or inappropriate caring by children and young adults. The Local Authority can combine the needs assessments of more than one family member if everyone agrees. To do this effectively requires local services working together across the statutory and voluntary sectors to consider the whole family’s needs. A young carer’s needs assessment must include an assessment of whether it is appropriate for the young carer to provide, or continue to provide, care for the person in question, in the light of the young carer’s needs for support, other needs and wishes. A local authority, in carrying out a young carer’s needs assessment, must have regard to the extent to which the young carer is participating in or wishes to participate in education, training or recreation, and the extent to which the young carer works or wishes to work. Assessments of a young carer must always take into account the capacity of their parents to offer a level of care necessary to respond appropriately to the child’s needs. Parenting capacity will need to be assessed in the context of the family’s structure and how family members relate to one and other and to their wider community. Where the person is a young carer, caring for their parent (or a parental figure) it will be important to protect the child from taking on a role in which they feel responsible for “parenting” the adult who would usually be caring for them. The results of a young carer’s needs assessment will include establishing whether the child should be provided with services as a “Child in Need” (under section 17 of the Children Act). The starting point for any assessment will always be children are children first. Where the Youth Offending Team is involved, the YOT case manager will be expected to contribute to the statutory assessment. YOT staff may have also completed or contributed to an Early Help Assessment. All specific youth justice assessments will take account of any statutory assessments and plans in place for the young person. Youth Offending Teams carry out assessments for young people in a range of circumstances: young people at risk of offending (i.e. prevention services), triage and diversion, out of court disposals (e.g. Youth Cautions) and statutory interventions. The main framework for the assessment of young people in the youth justice system is Asset, which will be replaced by AssetPlus from January 2016. Asset and AssetPlus are assessment and planning frameworks approved by the Youth Justice Board and mandated by National Standards 2013. Asset and AssetPlus provide frameworks for practitioners to analyse the young person’s offending and anti-social behaviour and identify factors or circumstances which may contribute to similar behaviour in future. AssetPlus places a focus on identifying strengths and factors which may help or hinder the process of desistance. The information gathered from ASSET (and in future AssetPlus) is used to inform court reports and help formulate plans of intervention to address needs, safety and wellbeing and future offending, including harm to others. Youth justice assessments follow many of the key principles of assessment described in detail in section 6 above, including effective engagement with young people and parents/carers (which involves the use of specific self-assessment tools), obtaining information from a wide range of sources, and making an assessment of parenting capacity. In all cases, a judgement will be made in respect of the likelihood of further offending, overall safety and wellbeing and risk of harm to others. In relevant cases, following a period of intervention, an additional assessment will be made in respect of young people who present an ongoing risk of harm to children. Where young people have admitted or been convicted of sexual offences, the AIM2 assessment framework will be used to identify strengths and concerns, which will inform intervention plans and reunification arrangements. Under section 3 of the Legal Aid, Sentencing and Punishment of Offenders Act 2012 a child becomes looked after by Norfolk County Council when they are remanded into Local Authority Accommodation by a Criminal Court or made subject of Youth Detention Accommodation. The statutory guidance for care planning and eligibility for services therefore also apply in these circumstances. Where a child is remanded to Youth Detention Accommodation a Detention Placement Plan will be prepared in addition to standard youth justice assessments and plans. The Detention Placement Plan will be undertaken by a qualified Social Worker in the relevant social care team. Visits to the secure establishment may take place in conjunction with the YOT Case Manager in order to avoid multiple assessment interviews for the young person and to encourage a joint approach to assessment. When a Statutory Assessment is triggered, the social worker will ensure that any other current or ongoing assessments by other agencies are identified and requested from partners. This means that all relevant information, assessments and plans, made by professionals with the child and family informs the Statutory Assessment. Professionals who have contributed to the Statutory Assessment will be recorded on the assessment form and their analysis of the main strengths and concerns of the current circumstances for the child and family will be explicitly taken into account throughout. If a Court has concern for the welfare of a child during the course of proceedings in a private law application then they can ask a social worker to conduct a Section 37 assessment. The information gathered during this assessment will assist in the decision making and care planning for the child. Where a child is currently in receipt of or has received a service from Norfolk County Council Children’s Services in the month, the court may ask Norfolk County Council for a Section 7 Assessment when they are considering any private law application under the Children Act 1989. Otherwise social workers from Child and Family Court Advisory Support Service (CAFCASS) may produce such reports for the court. A Private Fostering Assessment must be completed when a child under the age of 16 years (18 years if the child has a disability) has been cared for by someone who is not a close relative for longer than 28 days. The statutory assessment is to ascertain the carer’s suitability to care for the child/young person and must also consider the child’s needs to ensure the carers are able to provide suitable day to day care of the child/young person. Assessment of prospective adopters including step parent adopters are different from a statutory assessment of a child’s needs, but the child’s need must be considered when completing these assessments to ensure the adopters are able to care for the child and meet their needs. Special Guardianship Order / Child Arrangement Order assessments of friends or family capacity to become Special Guardians or exercise parental responsibility via a Child Arrangement Order for a child. This is different from a statutory assessment of a child’s needs, but the child’s need must be considered during any relevant private law or public law proceedings to ensure the carers are able to care for the child and meet their needs. Health assessments can provide valuable input and insight into the wider assessment process and should be considered for all children where a Section 47 assessment is being considered. Health assessments should be performed in a timely manner by health professionals who have the experience and capacity to undertake a comprehensive medical and developmental history and perform an appropriate physical examination. This will be a Specialist Paediatric Registrar, an associate specialist or a Consultant Paediatrician (a consultant would oversee all assessments). Practitioners undertaking the assessment of Sexual abuse requires additional forensic training and have relevant experience and competence which the majority of paediatricians will not have. In cases of physical abuse or neglect a discussion should take place initially within your own agency and in consultation with CADS if appropriate. Cases can be discussed with the local on call Consultant Community Paediatrician during the day and a decision regarding the need for assessment and the timing of an appointment agreed. In some cases an urgent appointment will be arranged depending on the needs of the child. If there is an injury to an infant under 1 year or a significant injury requiring medical treatment (at any age), or an injury out of hours the acute paediatric team should be contacted. All cases where sexual abuse (historical or recent) is considered should be referred to CADS for a strategy discussion (police, children’s services and an appropriate health representative such as a paediatrician, forensic medical or nurse examiner) to decide whether a holistic medical assessment is required through the SARC (Sexual Assessment Referral Centre). The strategy discussion will agree the level of urgency and timing of the appointment. A decision regarding medical examination will usually be done after the ‘Achieving Best Evidence’ interview for all children under 13 and considered from 13-18 years. Examinations should be avoided from 10 pm to 7 am when young people are sleeping unless there is an exceptional reason, this is in the best interests of the child. These assessments take time. Historic cases (more than 21 days since assault) will usually receive a non-urgent appointment, ideally within 2 weeks of referral. If the assault occurred within 7 days of the disclosure the appointment will be arranged as soon as possible (avoiding 10pm-7am) in order that forensic samples can be obtained and if the assault occurred in the previous 7-21 days the timing should be agreed as part of the strategy discussion but seen within the 21 day window. If the child is under 13 this will be with a paediatrician and a crisis worker. A paediatrician would not generally attend if the child is over 13 unless they have additional needs. These examinations are undertaken by forensic nurse practitioners. Any limitations of a parent or older adolescent (16 plus) to consent and contribute to a statutory assessment under the Children Act 1989 may be assessed under Mental Capacity Act or Mental Health Act by health or adult professionals. In general it is good practice for the child’s social worker to attend the appointment to ensure that the child is supported and that all relevant information is shared with the medical practitioner. Norfolk’s social care practitioners work alongside children, young people, families, carers and other professionals in order to promote the best possible outcomes for the children. This means communicating, engaging, involving and acting on views appropriately. Asking for feedback is one of the best ways to understand how well this has been done and where it could be better. Gathering and using feedback promotes the reflective ‘learning’ culture we endeavour. It provides evidence of our progress and should be regularly discussed within supervision. Service user feedback is different from, and in addition to, ‘direct work’ with children and families, for example asking children, young people and parents/carers about their views on the reason for social care involvement and the ‘plan’ for the child. Collecting and recording information which demonstrates how service users have been properly included and involved in social care processes is built into all assessment forms and plans within the electronic recording system. It is a vital part of working with children and families. In addition, we seek to use information from compliments and complaints to inform practice development. A compliment is defined as a customer statement of positive recognition or praise for a service or individual. Where appropriate officers may acknowledge compliments. Any verbal or written compliments will be recorded by the member of staff receiving the compliment and be passed to the appropriate manager for recording on the Compliments Register. Any member of staff identified as being the subject or contributing to any matter giving rise to the compliment will be notified within three working days. Feedback on compliments will be shared with employees at appropriate timings. Service users’ views are important to us. We are committed to providing a high quality service to our residents and users. Our aim is to offer the correct services and encourage people to ask for our help. We think we get it right most of the time, however there may be times when things go wrong. If this happens, we want to hear so we can try and put things right. A complaint about Children’s Services will not have a negative effect on any services already being provided, or any applied for. Service users have a right to complain and the results of complaints can improve our services. If service users are not happy with the service they have received, or the way they have been treated, they should first talk to a member of the team or their manager. They will look into the concerns and try to correct them quickly; however, if service users remain unhappy, they can use the complaint contact details that are below to pursue a formal complaint. Norfolk would like to thank Cumbria, Westminster, Kensington & Chelsea and Hammersmith & Fulham for their permission to use some of their materials within this document. He/she is disabled, and “family”, in relation to such a child, includes any person who has parental responsibility for the child and any other person with whom he has been living. “Health” Means Physical or mental health. Harm is defined as the ill treatment or impairment of health and development. This definition was clarified in section 120 of the Adoption and Children Act 2002 (implemented on 31 January 2005) so that it may include, “for example, impairment suffered from seeing or hearing the ill treatment of another”. Suspicions or allegations that a child is suffering or likely to suffer Significant Harm may result in a Child In Need Assessment incorporating a Section 47 Enquiry also known as a child protection investigation. ‘Harm’ means ill treatment or the impairment of health or development, including for example impairment suffered from seeing or hearing the ill treatment of another. ‘Ill treatment’ includes sexual abuse and forms of ill treatment that are not physical. Physical abuse, sexual abuse, emotional abuse and neglect are all types of harm. There are no absolute criteria on which to rely when judging what constitutes significant harm. Sometimes a single violent episode may constitute significant harm but more often it is an accumulation of significant events, both acute and longstanding, which interrupt damage or change the child’s development.